Brian Myer: Bio & Choral Music | Santa Barbara Music Publishing, Inc.
Brian Myer (b. 1988) is a graduate from the University of Nevada, Las Vegas with degrees in music education and Romance languages. He has made appearances as a soloist performing both operatic and oratorio literature in his hometown of Las Vegas as well as abroad in countries such as Italy, Austria, and France. Myer’s attraction to writing choral music came at the age of 17 when he composed and arranged his first pieces using traditional poetry and popular music. His music was first performed by the Las Vegas Academy Singers in 2006, conducted by Myer himself, who was a member of the ensemble at the time. He went on to set the Irish folk song “Danny Boy” and returned to guest conduct the Academy Singers in 2007. The Las Vegas Academy subsequently commissioned him to arrange a piece for a performance by the choral department, and since then, Myer has continued to steadily compose. 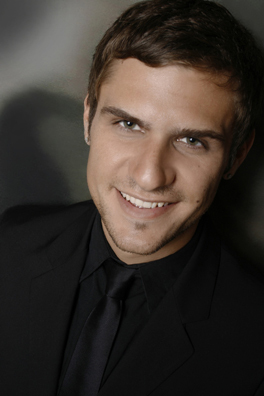 In 2010, he put on a composition recital at UNLV consisting of a cycle of five a cappella songs centered around the themes of love, the seasons, and a single rose. Actively pursuing a career in performing, teaching, and composing, he travels often and enjoys discovering new and inspiring forms of music. Brian Myer has 1 titles published with Santa Barbara.